On behalf of the fine Officers of the Maryville Police Department I would like to thank you for visiting our website. 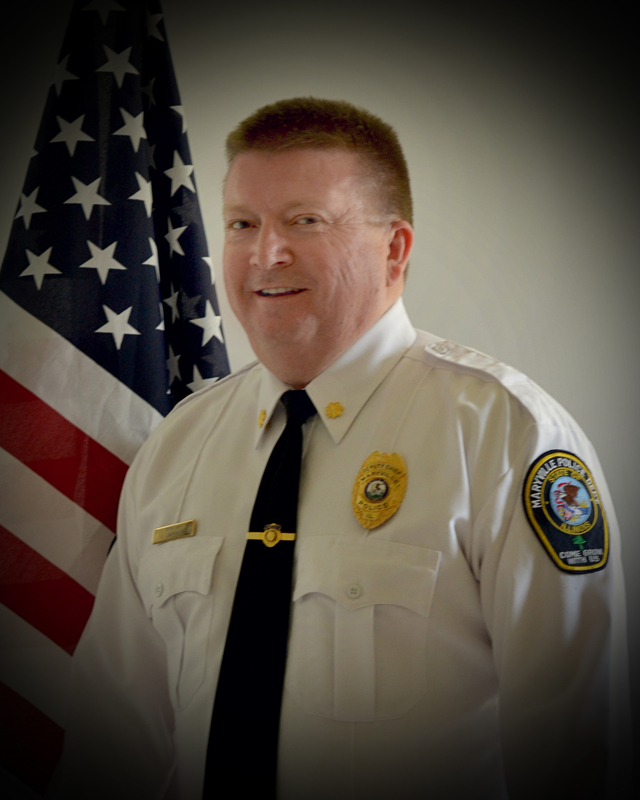 I am honored to have been appointed Chief of Police in Maryville effective December 30, 2013. Although the title of Police Chief is new to me, I am no stranger to law enforcement. I have served the public as a police officer for more than 23 years. During the course of my career I have worked assignments such as: Patrolman, Field Training Officer, Narcotics Investigator, Detective, Patrol Sergeant, Lieutenant, and Deputy Police Chief. I have an Associates of Applied Science in Administration of Justice from Southwestern Illinois College, a Bachelors of Science in Criminal Justice from Lindenwood University, and I am a graduate of Northwestern Illinois University’s School of Police Staff and Command. Mayor Larry Gulledge and the Board of Trustees have been very supportive in providing the funds to update our department with technology and equipment. The squad cars are equipped with cameras, computers, and radar units. Our officers have a taser, shotgun, and rifle at their disposal to meet incidents requiring different levels of force. The officers continually receive training to improve their skills and knowledge. Since 1990, our department has continued to host an annual children’s Halloween party located at the Maryville Grade school. With the support of donations from local businesses, we will continue this tradition in the years to come. The Maryville Police Department strives to keep the public safe through diligent patrol of neighborhoods and stern enforcement of traffic violations. Our community consistently has one of the lowest crime rates in Madison County. The officers are always willing to help fulfill the needs of our community, visitors, businesses, and citizens.